As the brits might say, UK-based Joanna Gruesome are bloody awesome. 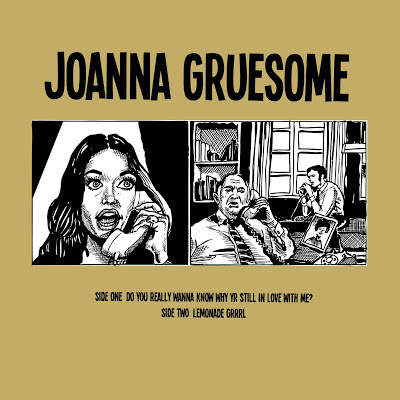 There are a lot of implications that come along with giving your band a witty name like Joanna Gruesome. With that being said, we're happy to confirm that the co-ed group lives up to all that's implied. The 5-piece from Cardiff definitely does not sacrifice sarcasm in their sound. And although some might be quick to categorize them as "twee," they aren't trying to be cute, not even close. Instead I found that both sides of this release were quite raw, relentless, and reminded me of first generation indie rock. Joanna Gruesome's first ever 7" is available through Georgia-based Happy Happy Birthday To Me (HHBTM) Records. Side one "Do You Really Wanna Know Why Yr Still In Love With Me?" is a true power pop gem that's lo-fi in all the best ways. This fuzzy and melodic song brings me back to the days of C86 when kids wore oversized cardigans and listened to cassettes and things were cooler (hello Primal Scream, The Pastels, Shop Assistants). With girl-boy vocals and plenty of pop hooks, this track – that starts off slow and builds up nearly to the point of explosion – isn't short of excitement. Just as supercharged, side two "Lemonade Grrl" conveys the sour 'n sweet attitude that one might expect from such a title. Candied vocals balanced out with slashing drums and volcanic sounding guitars keep this song from being too sweet, and giving us diabetes. This side especially proved to me how innocence and rebellion (hence the "grrl") can meet in the middle and make something great. Purchase Joanna Gruesome's HHBTM 7" here.